After many years of trying to encourage volume and height in our Yorkshire pudding attempts, I finally found a dependable recipe via Jamie Oliver. This is yet another variation on popovers, where an eggy batter needs rest (if containing gluten), a hot oven, and a well-greased pan. 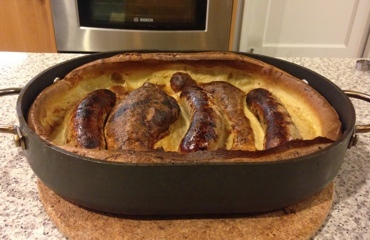 With sausages, this becomes the comforting dish, toad in the hole. My variation uses a bit less oil, in a broader roasting pan, with poultry-based sausages (chicken apple, or turkey apple) or sausage patties. The above photo was taken with a larger batch: 4 1/4 ounces flour, 3 eggs, and 1 1/4 cups milk, baked in a 10-inch roasting pan. Prepare the batter ahead of time, at least 2 hours—overnight is fine. Weigh out the flour in a large glass jug, and stir in the salt. When you’re ready to start baking, pour enough oil in an 8 inch square metal baking pan—about 3ish tablespoons. Brush some oil on the sides, too, if it isn’t a non-stick pan. Place pan in oven, on top of a baking sheet. Preheat oven as hot as possible without making you cough or producing smoke. For me, this was 475°F at the “speed convection” setting. When the oven has reached the temperature, carefully remove the pan and put in the sausages (or patties). Cover with foil to avoid splatter and smoke, and place it back in the oven. Bake until lightly browned about 5 to 7 minutes, turning once, then baking for another 5 to 7 minutes. After browning the sausages, remove the foil cover and quickly and carefully pour in the batter. Place the uncovered pan back on the baking sheet in the oven. Bake until the batter has puffed up and has browned, about 20 to 25 minutes. To avoid burning the pudding, I usually slowly lower the oven temperature after the first 11 to 14 minutes, usually by 25° every 3 to 5 minutes, so the ending temperature is 375°F. This was written by sairuh. Posted on Saturday, March 8, 2014, at 3:23 pm. Filed under Food. Tagged British, chicken, comfort, recipe. Bookmark the permalink. Follow comments here with the RSS feed. Post a comment or leave a trackback.